A number of substantial commercial units and zoned sites in a well located retail park in Collooney, Co Sligo, are expected to attract considerable interest when they go to auction on July 24. The properties are being offered for sale in four separate lots. Sole selling agent DNG Flanagan Ford is guiding the lots from €120,000 to €760,000. The lots are as follow. Lot 1, Units 1A & B: A warehouse of approximately 1,220sq m, currently set out as one open plan unit. Lot 2, Units 10 - 12: Warehouses of approximately 2,770sq m, currently set out as one open plan unit. 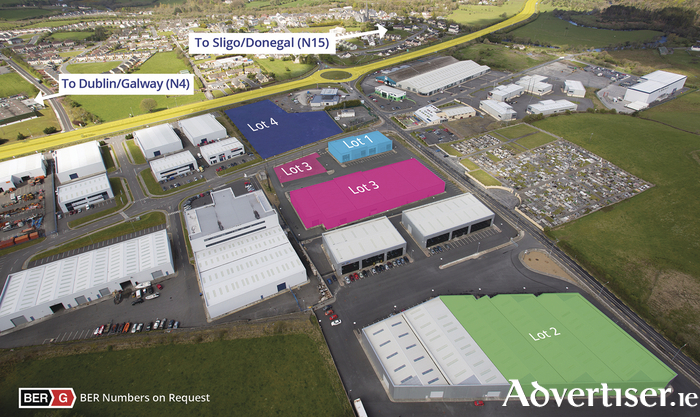 Lot 3, Site 2 and Units 3 - 7: A 0.12Ha (0.28acre ) site plus five warehouses of approximately 350sq m to 985sq m, total area approximately 3,920sq m.
Lot 4, Site A: 1.2Ha (2.95 acres ) site, zoned for commercial uses and suitable for development (subject to planning permission ). The properties are strategically located approximately 9km from Sligo at the Collooney roundabout, providing easy access to the Dublin (N4 ) and Galway (N17 ) roads. There are a number of high profile businesses currently trading from this prominent location including Ocean FM, PMM Merchandising & Marketing, Arrotek Medical Devices, CMD Training Institute, Gulf Oil, and Tuffy Wholesalers. Shane Flanagan from DNG Flanagan Ford who is handling the sale of these properties has advised that in his opinion the extremely convenient, high profile, location of these properties is sure to attract demand from a wide variety of both business users and investors. Commercial property activity over the past 12 months has improved considerably and there have been numerous sales of similar type warehousing/retail warehousing over the past year in this general area. Located at the junction of the Sligo, Galway, and Dublin roads, Collooney is ideally positioned being only 9km from Sligo town centre. Shane Flanagan also advised that as this is the largest sale of units of this type in the Sligo area they are expecting lots of interest from both local buyers and from the wider general market. For more information contact DNG Flanagan Ford at 071 9159222.